The Pioneer DJ DJM-S9 is a top shelf mixer for turntablists who want to do more than just scratch, and it’s an impressive unit, but it’s just not mind-blowingly great, or at least great enough to justify the price tag. 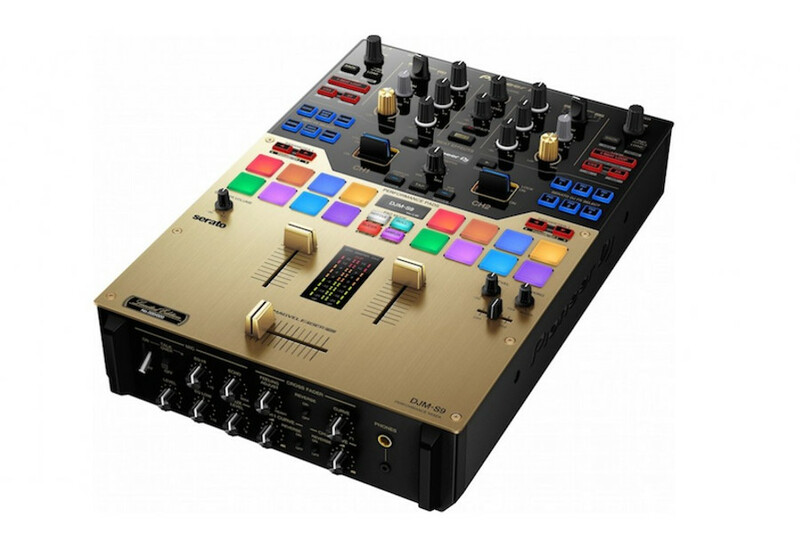 Still, if you’ve got the cash to burn and you’re a Serato DJ loyalist, the DJM-S9 is a good mixer that’ll afford you room to grow an expanded skillset of turntablist/controllerism techniques. 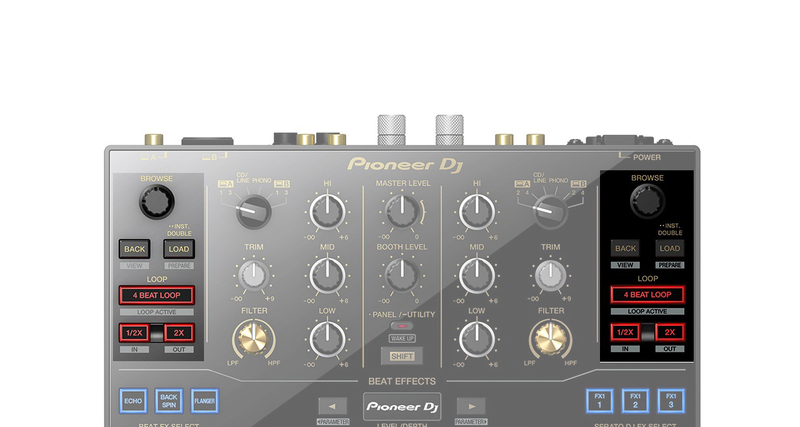 The DJM-S9 is Pioneer DJ’s new flagship two-channel battle mixer, designed to work with Serato DJ. The first thing that struck me was how light the DJM-S9 is – it weighs like a DJ controller, mainly because the bottom is made of hard plastic instead of metal. 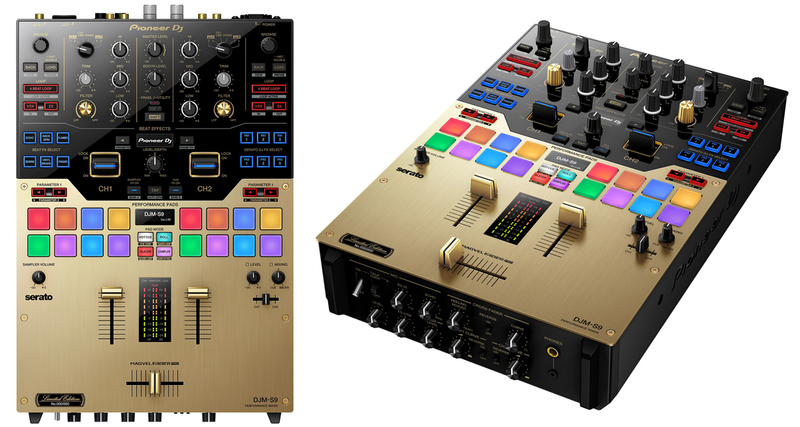 It doesn’t feel cheap, but I would’ve wanted a more robust construction, especially since you’re bound to take this around if you’re going to be DJing with it at gigs or showcases. 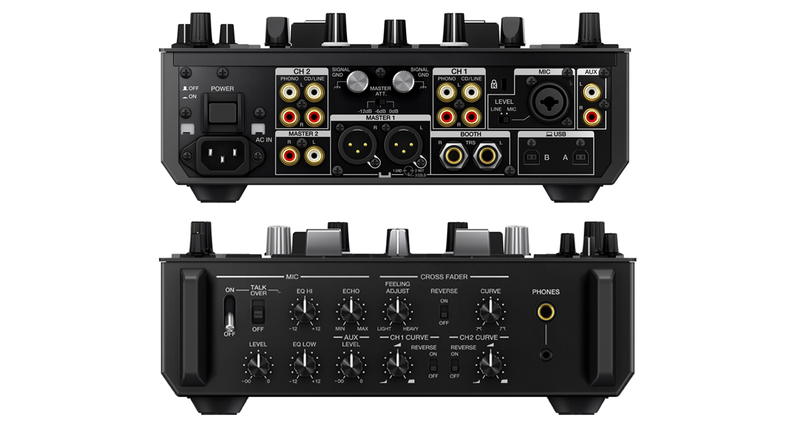 It’s got two pairs of Master outputs (XLR and RCA), plus a pair of 1/4″ Booth outputs. There’s a combo XLR input for connecting a mic, an RCA Aux input, plus two pairs of phono/line jacks for hooking up your turntables and CDJs. This is a two-channel mixer only, so while you’ve got inputs for up to two turntables and two CDJs, you can only use two of them at a time. There are a pair of grounding posts here for connecting your turntables’ earthing, which is a nice touch since most battle mixers have just one that you sort of crowd the grounding lead to. Not essential, but it’s a nice to have (Click here if you don’t know what these grounding posts do.). The DJM-S9 has inputs for hooking up two turntables and CDJs, an Aux source, plus a microphone, and you’ve also got two pairs of Master outputs and a Booth out. The front panel has controls for the microphone, Aux channel, and volume and crossfader adjustments. From the get go the volume faders are nice and slick, plus the new Magvel Fader Pro crossfader also feels great – if it doesn’t, you can adjust how loose or tight it is depending on your preference. I like to have crossfaders pretty loose, they kinda remind me of the Stanton Focus Fader from the 2000s in those old scratch mixers. My review model is the gold version, and apart from the flashy / garish appeal (depending on how you feel about bling), it’s completely identical to the standard black model. It’s meant to work with Serato DJ (it’s got controls for Serato DJ FX, which we’ll get to later), but I found videos online of it working with Rekordbox DJ (plus mapping), and even Traktor Pro 2, but none of them work as tight or straight out the box as Serato DJ. I hooked up a matching pair of PLX-1000s (so much gold right now), connected my speakers and laptop running Serato DJ, and was off. One word: complex. Part of what made battle mixers of yore attractive to scratch DJs was how spartan they were: two channels and a smooth crossfader were all you really needed – some scratch mixers like the Vestax 06 didn’t even have three-band EQ and master output cueing! Of course more recent scratch models like the Rane Sixty Two have included modern features like cue points and dual USB, making for a more robust mixer, but in terms of capabilities (and layout crampedness, in my opinion), this takes the lead. It’s a complicated-looking mixer, but let’s take it apart section by section. There are three parts to the DJM-S9: The top portion includes the EQ, output and browse knobs, loop buttons, and switching matrix. 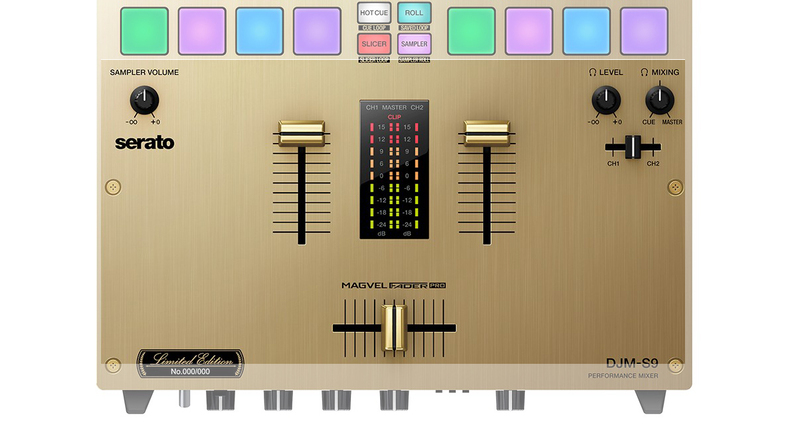 The middle contains the FX selectors, paddle switches, and performance pads, and the bottom contains the volume and Magvel Fader Pro crossfader, as well as the customisation controls for these faders. The DJM-S9 has a three-band hardware EQ section as well as dedicated filter and trim knobs per channel. 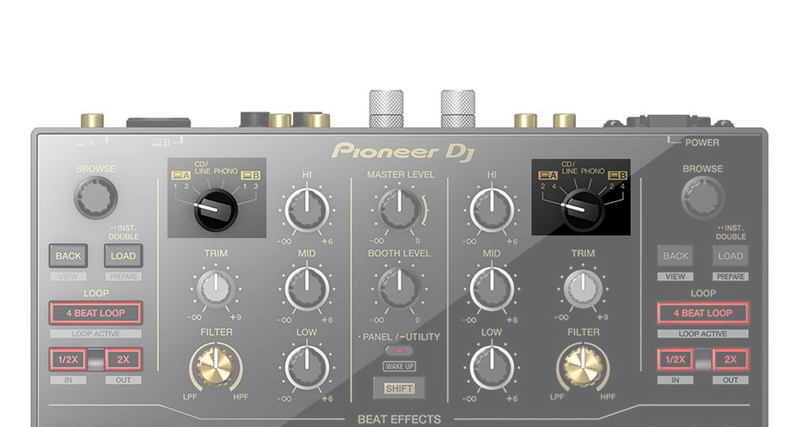 The DJM-S9 features EQ knobs for the highs, mids, and lows, as well as trim pots. These all have a nice, quality rubber knob cap that feels great. There are also filters for both channels, but the cap here is made of a hard plastic. I’d have preferred this to be the same rubber material as well, but I guess Pioneer couldn’t find any gold rubber caps here. The Master and Booth output knobs are also located here in the EQ section of the mixer. You switch from among the different input sources for both channels using the switch near the top of the DJM-S9. Near the top of the unit is the knob for switching among the input sources for both channels. The DJM-S9 comes with two USB sockets for plugging in two laptops, and you can select whether you’d want a channel to control either laptop through the switching matrix. 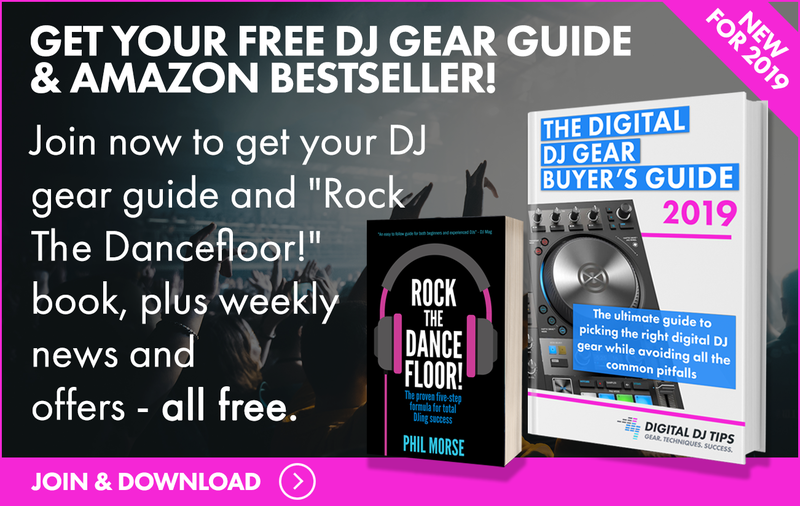 You can also choose whether you’d want to run a line or phono input through the channels, so if you want to play from CDJs or spin actual vinyl during your DJ set, you can do it here. 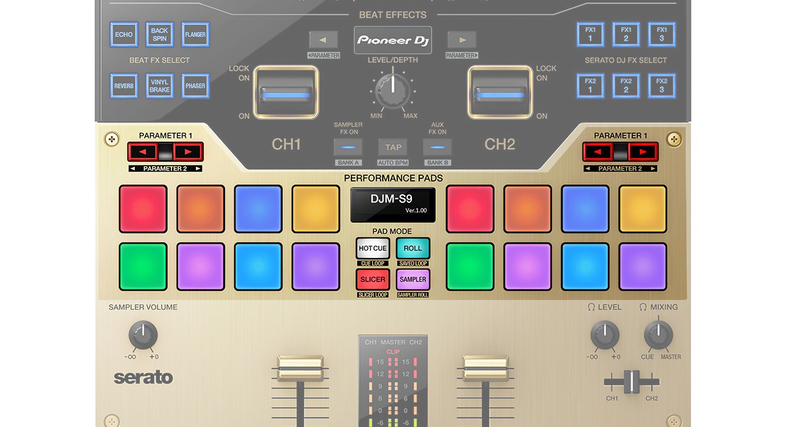 The DJM-S9 has identical browse and loop controls per channel. There’s a browse knob per channel on the DJM-S9, as well as load and navigation buttons for your library. There’s a “4 Beat Loop” button, that automatically sets a one bar loop (one bar = four beats) in Serato DJ, and there are buttons for halving or doubling this loop. You can also set manual loop in and loop out points by pressing the Shift button, which is found tucked away beneath the Booth output knob and surrounded by the other EQ controls. Not an ideal position, but it works. The DJM-S9 comes with two FX switching sections: Beat FX, which are Pioneer DJ onboard effects, and Serato DJ FX, which let you switch from among the effects you’ve got loaded in Serato DJ. The FX section on the DJM-S9 is among the most complex I’ve seen. 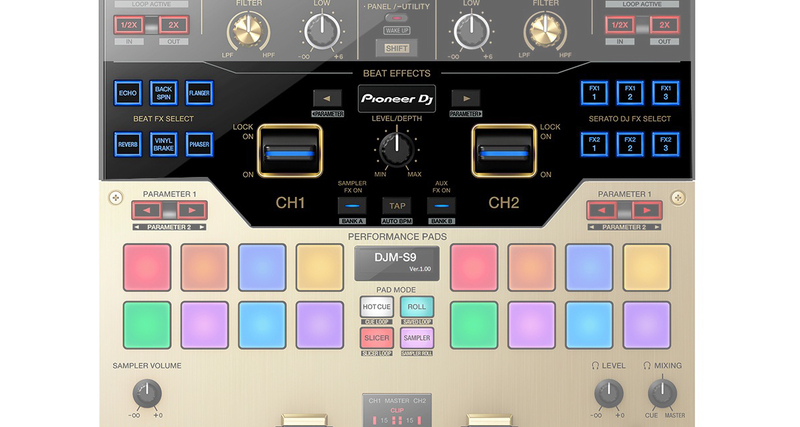 There are two banks of switches: on the left you’ve got Beat FX Select, which lets you choose from among six of Pioneer DJ’s onboard effects (echo, backspin, flanger, reverb, vinyl brake, phaser), and on the right you’ve got Serato DJ FX Select, which lets you choose from among the six Serato DJ effects slots. Clicking the FX button of your choice brings up the effect on the DJM-S9’s centre display, which has two parameter buttons that let you modify a setting of a particular effect (delay time, in the case of the delay effect, for instance), and there’s a level/depth knob for controlling how much of the effected audio is sent to your Master output. Unique to the DJM-S9 are these two FX paddle switches that turn an effect on/off two ways: if you pull them down, they engage your chosen effect momentarily. If you push them up, they stay locked in the “on” position until you pull them back to their starting position. One of the coolest bits on the DJM-S9 are the effect paddles: when you pull them down, they act as momentary switches and turn the chosen FX on, meaning when you let go they snap back to their original position, turning the FX off. If you push them up, they stay locked in that position, meaning the FX stays activated, and you have to switch it back to the centre position to turn it off. Turntablists will like this, especially since it’s possible to do some quick FX in and out cutting for added flair during routines. The performance pads on the DJM-S9 feel good and are responsive, although it’s a bit too easy to accidentally trigger a pad adjacent to the one that you’re hitting. There are eight RGB-backlit pads here that have four modes: Hot cue, which lets you set, trigger, and delete cues in Serato DJ; Roll which lets you do loop rolls of varying lengths; Slicer which engages the Slicer function found in Serato DJ, letting you play a portion of music in “slices” using the pads; and Sampler, which engages the SP-6 Serato DJ sample player. There are two parameter knobs for adjusting pad settings, such as Loop Roll note length for instance. I have a love hate relationship with these performance pads: on the plus side, they’re very responsive and stiff, perfect for drum fills and cue point juggling which modern battle DJs will enjoy. 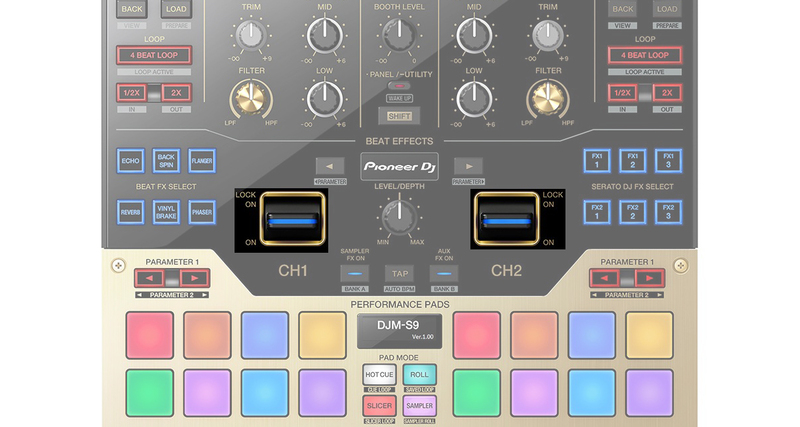 However, I do find them a bit too responsive and, combined with the fact that they’re smaller than what you’d find on controllers like the DDJ-SX2 and DDJ-RZ, I found that I would accidentally hit some of these pads in the middle of performing. This isn’t a big deal if you’ve got no hot cues set, but if you do have them prepped (say, in a routine) and you graze a neighbouring pad while hitting the one you’re supposed to, it’s frustrating. Having said that, it just needs some getting used to. 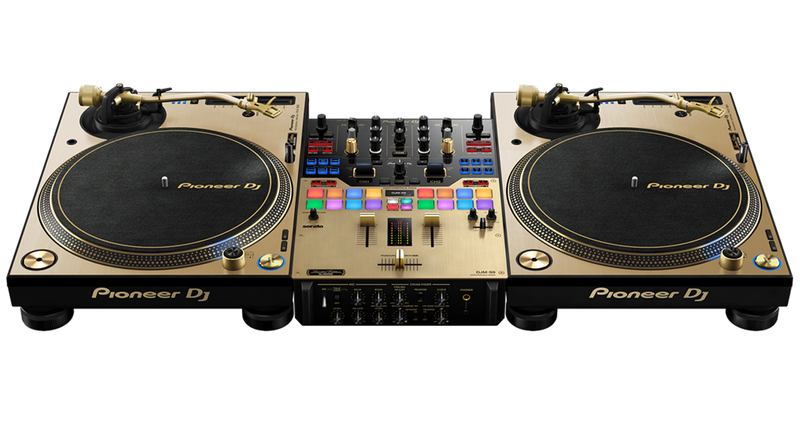 The DJM-S9 has two volume faders with adjustable curves and reverse switches. The Magvel Fader Pro crossfader also has a curve adjustment and reverse switch, with the added “Feeling Adjust” knob that tightens or loosens the fader. There are two volume faders and one Magvel Fader Pro crossfader on the DJM-S9. All three have adjustable fader curves as well as reverse switches, but the Magvel Fader Pro crossfader is the only one with the “Feeling Adjust” knob, which lets you set it from very loose (tilting the mixer moves the crossfader left to right), to tight. 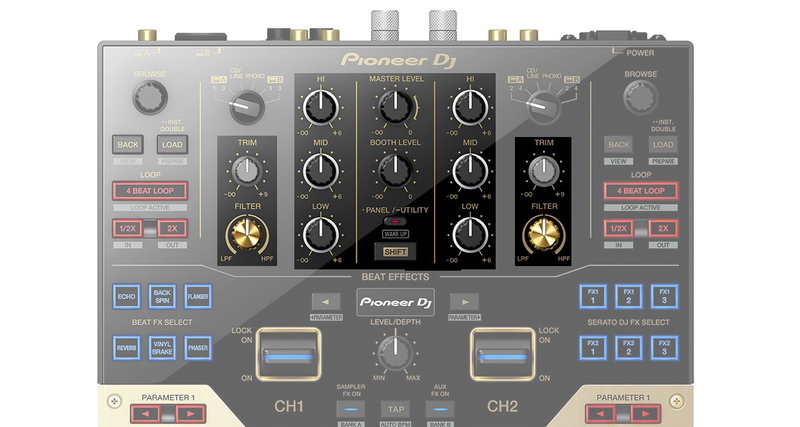 This alone could be the main draw for a lot of scratch DJs, because it’s the best and most customisable crossfader that Pioneer DJ has placed in a mixer so far. I’m not a scratch whiz, but I can appreciate a smooth, buttery fader that cuts quick and clean, and this is it. On either side of the mixer section are volume controls for the SP-6 Sample Player, as well as your headphone level, cue/master mix knob, and a “cue monitor” fader that lets you blend channels one and two in your headphones. Finally, the mic section on the front panel of the DJM-S9 is also quite extensive, with mic on/off and talkover switches, volume knob, two-band EQ, echo effect knob (why is there never a reverb knob on mic channels, by the way?) and an Aux level knob for adjusting the input of a line level device that you’ve got connected in the back, like a smartphone or tablet. The DJM-S9 is a top shelf battle mixer for turntablists that want to do more with their scratching by adding controllerism elements into the mix. Shown here is the DJM-S9-N with the PLX-1000-N, which I’ve got to say looks pretty damn impressive. Clearly, scratching and DJ battles have moved forward, and the DJM-S9 is futher evidence of that. I’m no battle DJ, but I know a thing or two about scratching, having been the turntablist (albeit not a very good one) in a nu-metal band in the early 2000s (shudder!). I’ve gone through really bad scratch mixers, the type with crossfaders so stiff you thought the assembly line spilled beer on them on purpose, and I’ve also used decent workhorse mixers like the Vestax 05, 06, and 07 through the Rane 56. Out of all these mixers, I’ve got to say that I enjoyed the feeling of the DJM-S9 the most, even when I’m just focussed on the quality and performance of the Magvel Fader Pro crossfader. The FX section will also be a big draw to turntablists looking to extend their palette of creative tools – the FX paddles are a cool feature to have, but I wouldn’t call them essential. They’re fun to use though, and I’m sure we’ll be seeing some impressive routines that employ them in the months to come. The performance pads feel good, but I really do think it’s too easy to trigger an adjacent pad by mistake. A settings adjustment or firmware update should fix this, no problem. The EQ, loop, and browse sections aren’t anything to write home about, but they do work well and, more importantly, they’re there for you to use instead of being omitted. The Pioneer DJ DJM-S9 is a top shelf mixer for turntablists who want to do more than just scratch, and Pioneer DJ has done a good job of coming out with an impressive unit, but it’s just not mind-blowingly great, or at least great enough to justify the price tag for a next-gen battle mixer whose functionality takes a few pages from the Rane Sixty Two playbook, a mixer that’s been around for almost five years at the time of this writing. Still, if you’ve got the cash to burn and you’re a Serato DJ loyalist, the DJM-S9 is a good mixer that’ll afford you room to grow an expanded skillset of turntablist/controllerism techniques that’ll have you on the edge of performance if that’s where you want to see yourself headed.